Bird Watching Monteverde Cloud Forest Reserve – Private Tour with Private Nature Guide. Child Fare 6-10 years old: $99 USD per person. Come see the beautiful tropical birds species that live in the Costa Rican cloud forests of Monteverde. You will also have an opportunity to have a private tour of the famous Monteverde Cloud Forest Reserve. What better way to see tropical and migratory birds than in their natural habitat in Costa Rica? Book this private birding tour in Costa Rica so your guide can give you specialized attention you deserve as you seek some of the most-elusive birds in the wild! Leave bright and early to get a jump start on your birdwatching or take the tour at your own speed and leave a little bit later. With the luxury of a private tour, you get personalized attention from start to finish! You will hike through the well-marked-trails, waterfalls, rivers, and the observation area of the park. 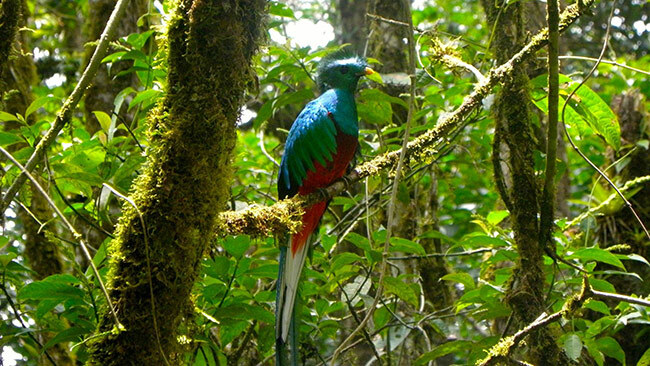 If you are lucky youmight spot a “Quetzal”, one of the most beautiful birds in the world. You will also see an amazing variety of flora and fauna in this tour.